DOGLOVE - for the love of dogs (and cats too! ): Oscar's still hanging on! Honestly, I thought by today I would have had to say goodbye to Oscar. He had begun to stop eating about 1.5 weeks ago. Thankfully, a friend suggested that I try Medi-cal Recovery canned food for him and he LOVED it - it got him eating again. I was prepared to live with the results of eating this food (diarrhea/soft stools) but so far, it hasn't been an issue at all except for the pungent aroma going in, AND coming out, lol! Last weekend, I decided to make a simple ground beef recipe for him at the suggestion of our friend Lee Anne. It's just ground beef, diced sweet potatoes, chopped green beans, and a large can of Aylmer Accents Petite Cut Tomatoes in Garlic and Olive Oil. Well, he absolutely loves this too (as do Delta and Brosa). The first time I fed him last Sunday morning, he threw it up about 5 hours later - I thought he was having trouble digesting it, but it was more likely the fact that I bathed him and took him for a drive that day. Why did I torment him with a bath? 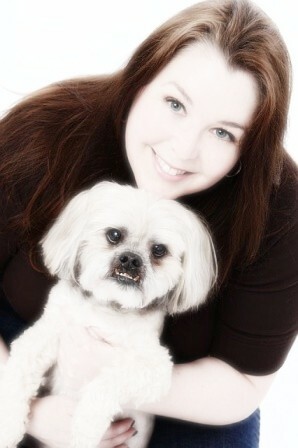 Because we went to Sabrina Thurlow Photography to get his portrait taken! His breakfast ended up on her floor (and not her backdrop as I moved him off there just in time thank goodness!). We spent about 1/2 an hour there and got some very cute pictures. When I went to view them on Thursday, I couldn't just pick one, and so I purchased the Pet package to get all of the photos on a dvd with the purchase of a certain value of prints/collages. Here is one photo I can share (I added a "soft glow" effect to it as the photos on the dvd are unretouched - my prints I choose will be touched up in places by Sabrina). What a gorgeous portrait!! We are keeping our paws crossed that your beloved Oscar continues to do better.